Hello friends, Debbie with you today sharing a little desktop reminder that Spring is just a few short months away. We have long winters here in Wyoming and sometimes we need a little reminder that Spring is coming and we can get out and enjoy the weather soon. The frame is a paper mache frame that I found in a craft store in Idaho while visiting my son and his family, I picked them up for $1 each and that put a huge smile on my face! To start off decorating the frame I painted it with Gesso and then stenciled it with a Prima Stencil and modeling paste. Next I sprayed it in random areas with several colors of Glimmer Mist. The next step is to emboss the modeling paste with Ultra Thick embossing powder. I used a Pewter color. 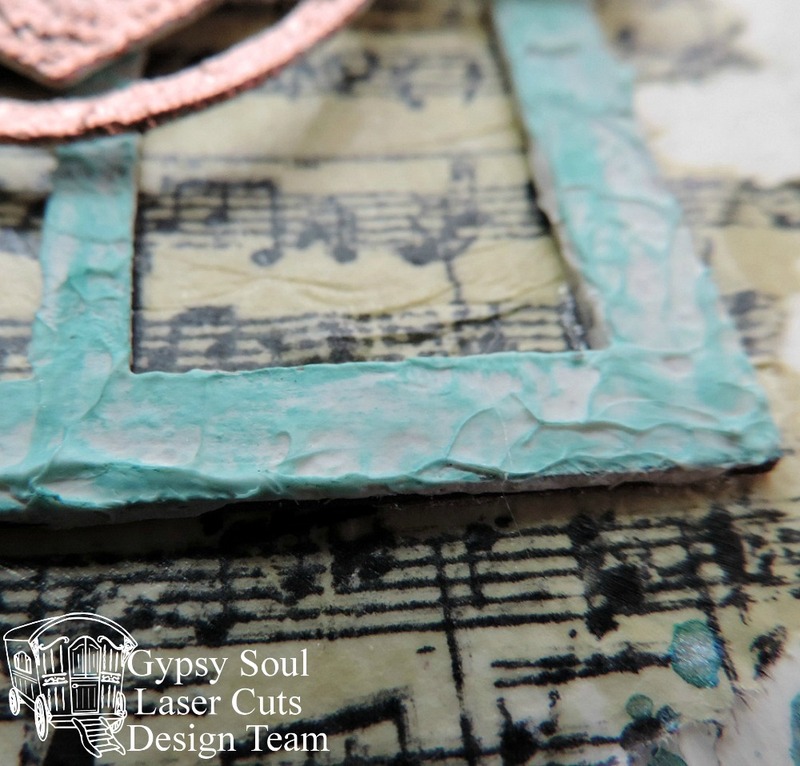 Add some stamping and ink the edges to finish off the frame. 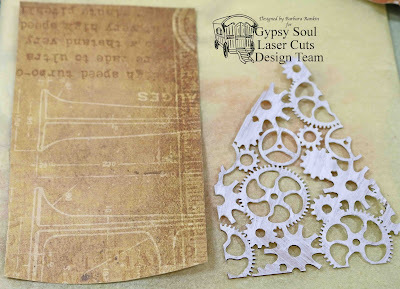 The next piece I used was Gypsy Soul Laser Cuts Page Frame Art Deco. It looks like this unfinished. I painted it in a turquoise blue acrylic paint and again embossed it with Ultra Thick embossing powder. I adhered it to the frame and added all my fussy cut pieces and embellishments. I hope you enjoyed my project today and thanks for stopping by Gypsy Soul Laser Cuts today! Hello lovelies. I saw and heard something that inspired me and I decided to go for it. 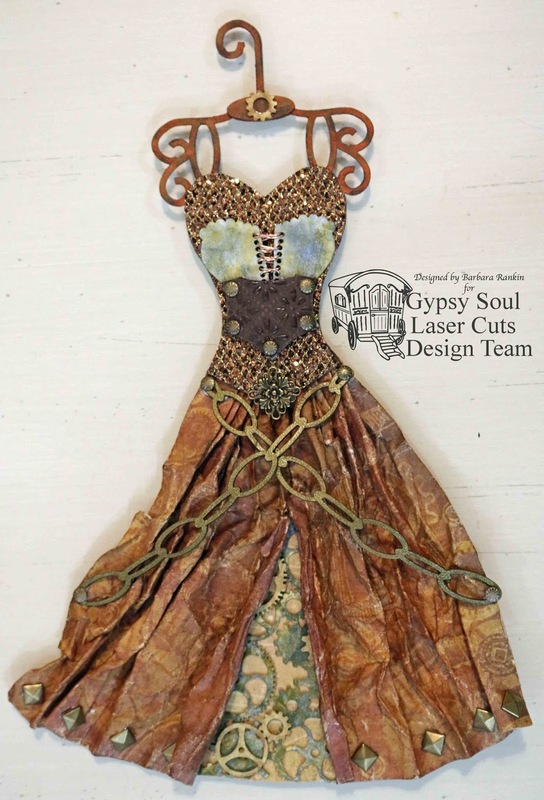 I don't normally do chipboard art journal pieces, but decided to turn my recent art journal piece to come to life. The Windows 4 Panel got a coat of modeling paste. I didn't want it smooth. I wanted it choppy so that when I went over it with my Prima Chalk Edger it really brought out the details so much. The heart is my favorite piece. I started with some gloss gel and glitter but didn't like it so I wiped it off. 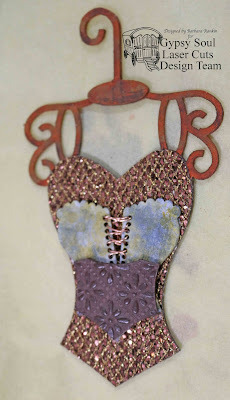 Then went in with more gloss gel and covered it with some copper embossing powder. 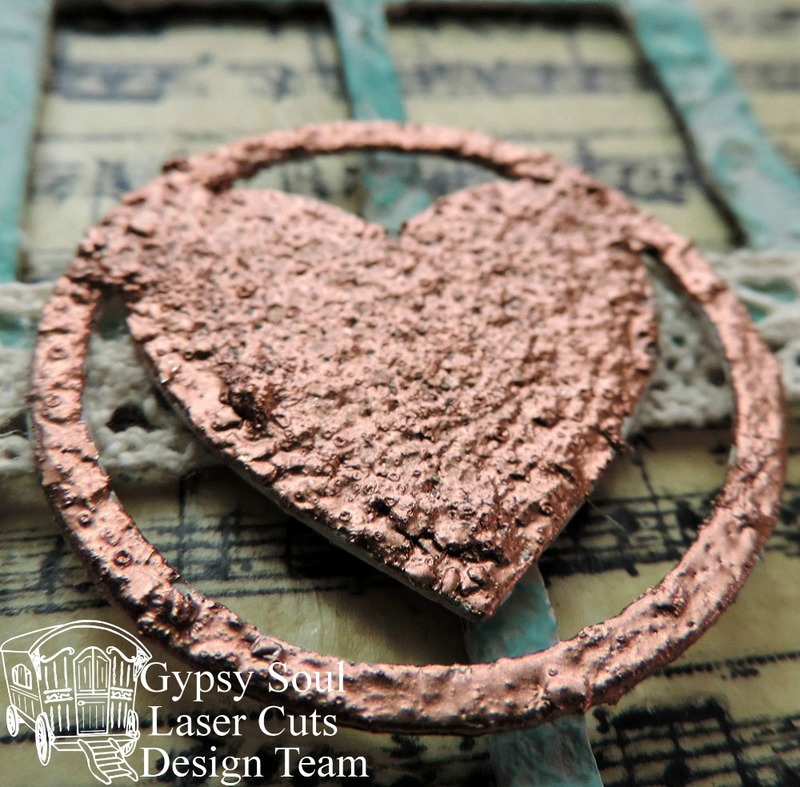 The magic happens when you use your heat gun to melt the powder. It bubbles underneath with the melted powder an created this amazing look. 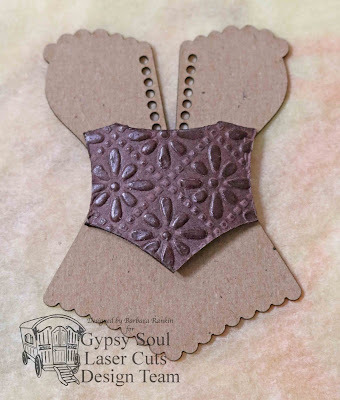 So don't forget to play with some embossing powder or modeling paste. I was in a bit of a Harry Potter mood this week, as you'll see below. I've designed a front window shrine based on the movies and books of the Harry Potter series. Specifically, the Flourish & Blotts bookstore where the students purchase their books for the coming school year. The Square Shrine Shadowbox from GSLC is absolutely perfect for making shop windows and attached sign. The shop window is filled with handmade books and scrolls in various sizes and thicknesses. There's also a lovely old lantern in the bottom right-hand corner of the window. I just printed the sign off on my printer, cut out some squares from cardstock and cerealbox, all giving the project it's layers. The window itself is clear and firm plastic from a box our Christmas ornaments came in this year. Everything can be used as a craft supply, I swear! I think my husband hates me for it though! The books are not openable and are all glued in place so that nothing will get jostled. I've covered the back in some scrapbooking paper to give it an extra "magical" touch. That's it from me this week! Hope you have some fun making your own shop windows! Hey there Paper Peeps! 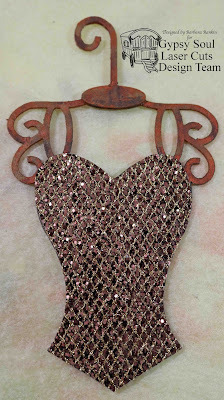 I'm dropping in to share a very Western inspired Wall Hanging. 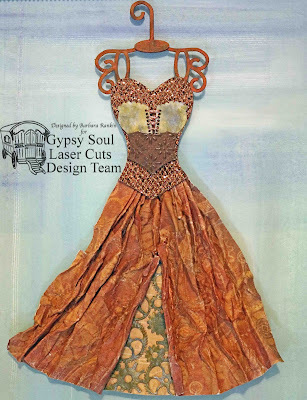 It's not my normal style....kind of a walk on the wild side...but I had so much fun altering the Gypsy Soul Laser Cut chippies and adding layers of patterned papers and embellishments. 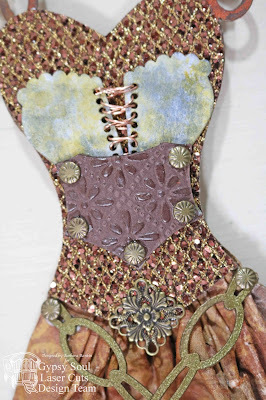 With a small detail brush add a layer of Gesso to the chipboard. This Gesso I've used is canvas primer Gesso and it's just a bit thinner and won't get gummed up in the intricately cut areas. Using dimensional Bisque colored Liquid Pearls add detail to the Barbed Wire Frame. Add Dark Chocolate Liquid Pearls to the outside ring of the Dreamcatcher. Add another layer of Gesso to the frame. While I was working with the Gesso I added some to the fussy cut images. Using a metallic silver paint cover the Barbed Wire Frame and 8 point stars. Working in small sections add black acrylic paint and wipe away with a dry cloth leaving the shading in the dimensional areas. Begin adding color to the center of the dreamcatcher with Spectrum Noir Markers. Add shading by using a darker color of the marker leaving the center white. Finish the Dreamcatcher with complimentary glitter glues. This will not only give a richer color...but also seal in the alcohol inks. I've finished the feathers with the same steps as the Dreamcatcher shading with dark on top and blending to light. I finished the feather tips with a bit of flocking held on with the litter glue. 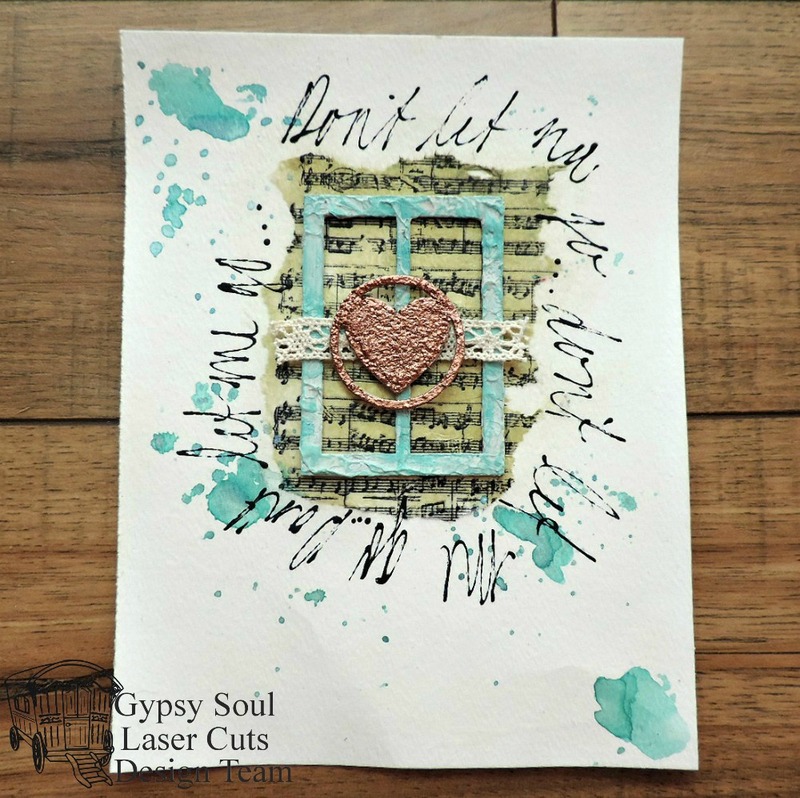 For a complete list of supplies please visit me at Polly's Paper Studio. Hello and happy Thursday! 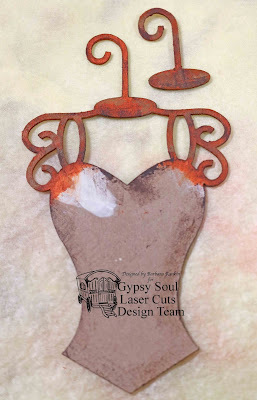 Barbara here again with another project using these fabulous Dressform Hang Ups from Gypsy Soul Laser Cuts. 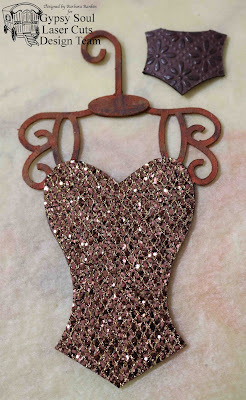 If you recall, last week I shared a Shabby Chic Dressform Hang Ups. Click here to see that post. This week, I am going all out in Steampunk style. Step 1: Paint Dressform Hang Up with Titan Buff, then rust, and dry brush with burnt umber. Glue hanger piece on top of dress form hanger to create dimension. Step 2: Trace bodice onto jeweled paper, cut out and adhere to Dressform Hang Up. 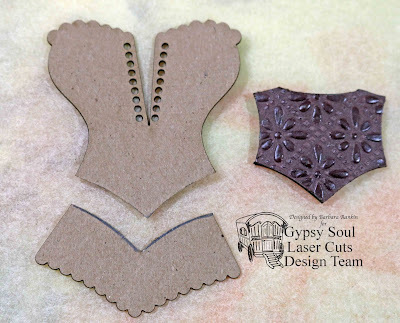 Step 3: Use chipboard piece removed from Dressform Hang Up trace and cut out embossed faux leather paper, adhere to piece. Step 4: Place faux leather piece over corset, trace lower edge and remove. 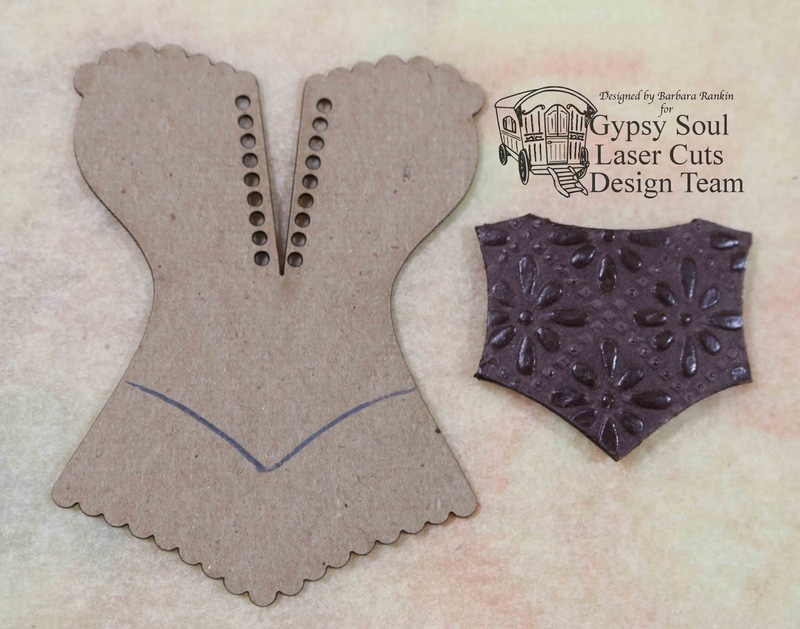 Step 5: Once removed, cut corset apart, as shown. Save bottom piece for another project. 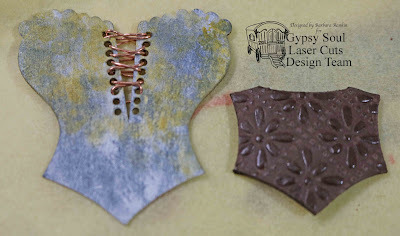 Step 6: Paint corset with Paynes Grey, dab with Translucent Yellow Oxide, and cover with Titanium White antiquing cream. Remove some of the antiquing cream with damp baby wipe to give the appearance of a patinated metal. 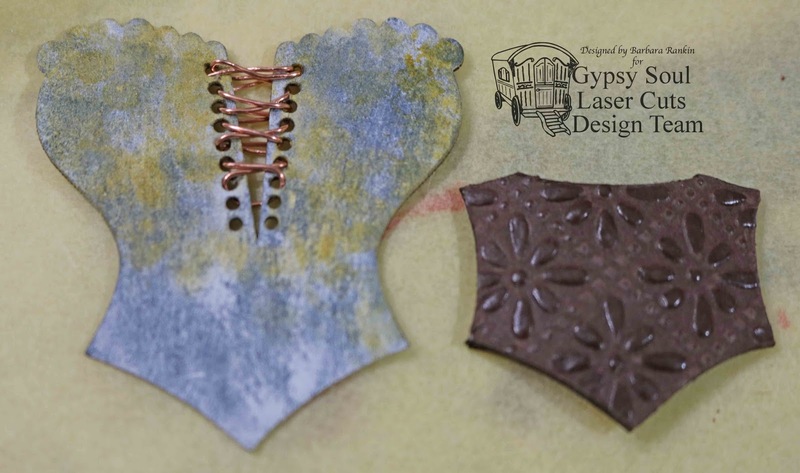 Thread 22g copper wire through holes in corset. Step 7: Glue corset to bodice, then glue faux leather belt on top, as shown. Step 8: Cut patterned paper to 7" x 12". Spritz with water and gently crumple the paper until soft. Carefully tear up the center and roll the edges. 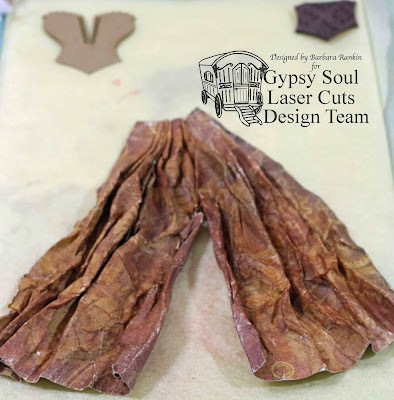 Very gently shape the paper and dry with heat tool. It will become very stiff and hold its shape. Step 9: To make the underskirt, cut a piece of coordinating patterned paper to fit the opening. 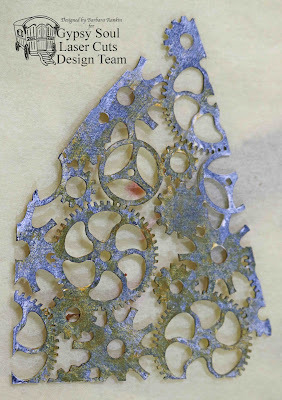 Also trim a piece from the Texture Sheets Gears and paint with white gesso. Step 10: Paint Texture Sheets Gears with Paynes Grey, dab with Translucent Yellow Oxide, and cover with Titanium White antiquing cream. Remove some of the antiquing cream with damp baby wipe to give the appearance of a patinated metal. 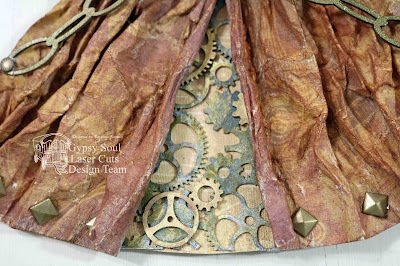 Step 11: Glue gears and print paper beneath the opening in the skirt. Cut apart a few more individual gears from the Texture Sheets Gears, color with antique gold paste wax, and adhere randomly over the bottom texture sheet, as shown. Step 12: Glue skirt to bodice, as shown. Use a good, tacky glue and place a heavy object over it until the glue dries. 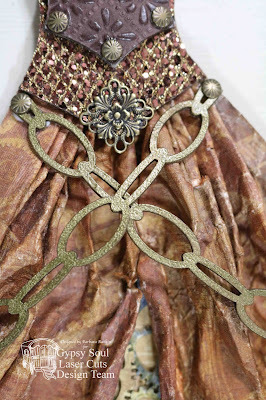 Step 13: Cut chain link in half, add gold metallic ink and heat emboss with gold embossing powder. Adhere to skirt in a crisscross manner. Add a metal charm and metal studs, as shown. 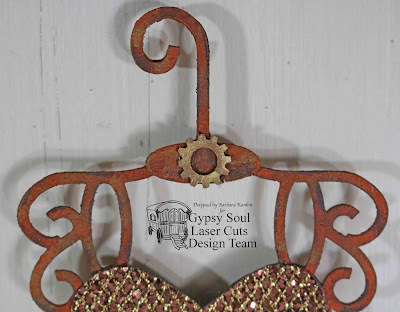 Step 14: Add one individual gear that is colored with antique gold wax to the hanger, as shown. I have to tell you that I am having a blast making these! I can see many uses for them, as I said before. And you are not limited to making the skirts from paper. How about scraps of fabric, netting, tulle, ribbon, and so on. 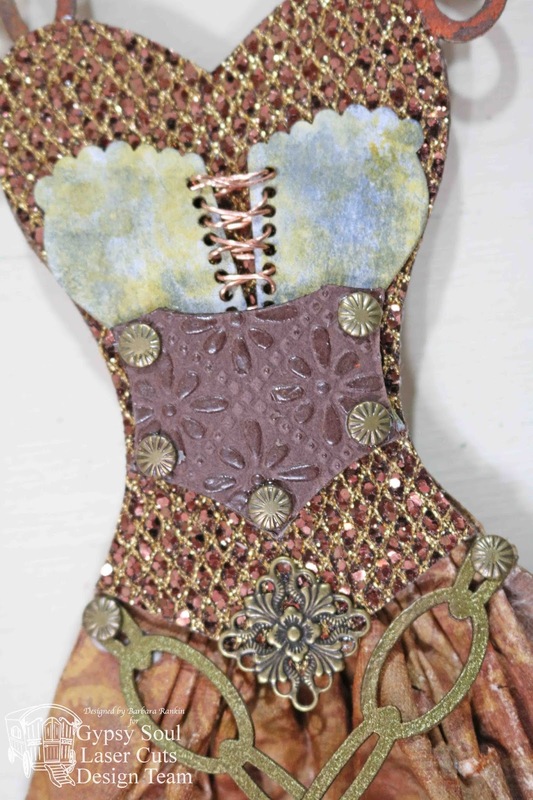 And think of the embellishing possibilities. You are limited only by your imagination! So stop by Gypsy Soul Laser Cuts to see the wonderful selection of intricately cut chipboard you could use to make these your own! I hope you have enjoyed my guest design spots with Gypsy Soul Laser Cuts. I have exciting news to share next month with you SO stay tuned!!! Give each piece a coat of white gesso. Allow to dry completely. 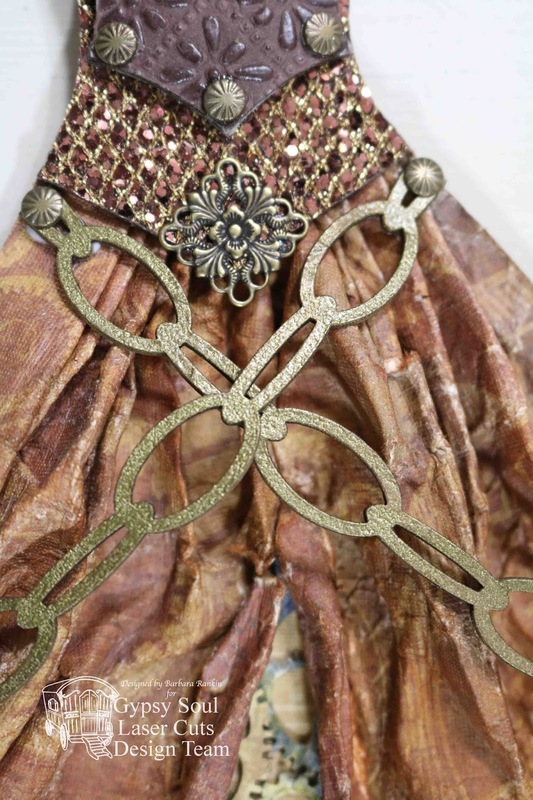 Apply Tarnish Brass Distress Paint to top of each piece. Allow to dry completely. Paint the pieces of Diamond Texture Sheets with Bundled Sage, Forest Green and Peeled Paint Distress Paint. Paint the bird with Salty Ocean Distress Paint. 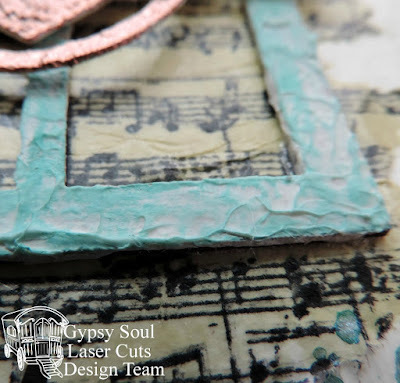 Allow each layer dry completely before adding next layer. Paint both canvas with Picked Raspberry Distress Paint. Allow to dry completely. Add a light coat of Spun Sugar to top. Allow to dry completely. Stamp image using black paint. Allow to dry completely. Add white gesso to larger canvas using stencil and pallet knife. Allow to dry completely. Spatter smaller canvas with black paint. Allow to dry completely. Adhere to top of larger canvas. Add painted "Hope" from the Word & Phrase 2 to top of Bird in Ivy Wreath to finish your canvas. I "hope" you enjoyed my painted canvas. 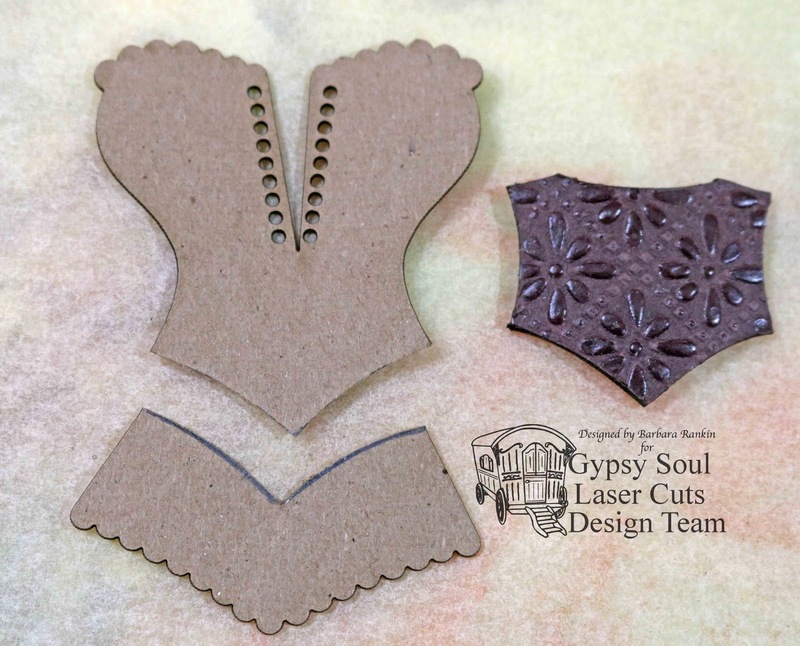 Make sure to check out all of Gypsy Soul Laser Cuts fabulous chipboard.